Stuart presents the iconic music of TV composer Barry Gray performed by Charles Hazelwood’s All Star Collective at St George’s Bristol. Barry Gray created some of the most memorable music on British television and film from the 1960s onwards including Thunderbirds, Joe 90, Captain Scarlet and Stingray. His style combines big band swagger, sci-fi strangeness and soaring theme tunes. Conductor Charles Hazelwood is joined on stage by a stella cast of musicians including Jarvis Cocker and members of the British Paraorchestra. (2) IT’S TIME. Geoff Willmets advocates “The necessity of deadlines” at SF Crowsnest. Being creative to a deadline is actually good for you because it prevents your mind wandering from what is essentially a lot of hard work. As the deadline approaches, your brain becomes extremely focused on getting things done correctly. I’ve seen myself go into super-drive doing it and at the same time, knowing that giving myself a little distance from the work as well, actually helps as well. The early drafts often look slightly out of focus and polishing them just sharpens them up to what you want to achieve. (3) JIM ANSWERS. Raymond Bolton interviewed Jim C. Hines about his novel Revisionary and life as a writer. Most writers will envy your new situation. Why do you write and when did you first realize you were a writer? I write because I enjoy it. I love inventing stories and sharing them with people. There are days when it’s frustrating or painful trying to get the story in your head onto the screen, and it’s just not coming out right. But then there are the moments when it comes together, or when you come up with a clever twist or idea, or you hit on something powerful. Those moments are amazing. Plus I like fantasizing about swords and magic and robots and all that other cool, shiny stuff. When did I realize I was a writer? That’s hard to say. I toyed with writing a bit as a kid. Started doing it more seriously toward the end of my undergraduate degree. To some extent, I started to really feel like a writer after my first fantasy novel Goblin Quest came out. And then there are the days when I still don’t entirely feel like A Real Writer. Like I’ve been playing a trick on the world for 20+ years and having a blast with it, but sooner or later someone’s going to catch on. (4) A CERTAIN GLOW. “Unexpected changes of bright spots on Ceres discovered” – EurekAlert! – Chemistry, Physics and Materials Sciences does not think the explanation is an asteroid having teenage complexion problems. (ESO) Observations made at ESO’s La Silla Observatory in Chile have revealed unexpected changes in the bright spots on the dwarf planet Ceres. Very careful study of its light shows not only the changes expected as Ceres rotates, but also that the spots brighten during the day and also show other variations. These observations suggest that the material of the spots is volatile and evaporates in the warm glow of sunlight. (5) IT’S FIVE! At Tor.com, Myke Cole lists “Five Books About the Ancient World” – fiction books, that is. This book has a dated prose style that requires some plowing, but it’s worth the work for the incredibly compelling and well researched account of the genesis of Rome’s “Social War” that spelled the end of the Republic. McCullough’s book is so respected that it’s often cited as a source in secondary scholarship. It’s particularly valuable for those seeking to understand daily life in ancient Rome, from the vaulted heights of the Capitoline Hill to the filth of the Subura, McCullough covers it all. As with Graves, there’s more if you want it. The First man in Rome is the flagship offering in McCullough’s Masters of Rome series, a seven volume sweeping epic that will take you all the way from Marius and Sulla in 110 B.C. to Mark Antony and Cleopatra in 27 B.C. (6) SURPRISING A LIFETIME ACHIEVER. Rowena Cory Daniells calls winning the Peter McNamara Lifetime Achievement Award “Another Lovely Surprise”. It would be honest to say that I was stunned. When I went up to accept the award and had to stand there while Sean read out my list of achievements. It was excruciating. And there I was, giving an acceptance speech for a Lifetime Achievement Award when I used to be one of the vanguard of new faces. (7) DEBUNKING DISQUALIFICATIONS. K. Tempest Bradford advances “4 Reasons Why You (Yeah, You) Are Qualified To Nominate for the Hugos”. You haven’t read/watched/listened widely enough (according to you). You don’t have enough nominations in every category to fill ever slot you’re allotted. You don’t have time to read all the cool stuff recommended here and elsewhere and on the tag. You’re “just a fan” and not anyone fancy. I’m here to tell you that none of those things disqualifies you from nominating for the Hugos. None. Zip. Let’s break it down. (8) PRELUDE TO A BALLOT. Abigail Nussbaum reveals “The 2016 Hugo Awards: My Hugo Ballot, Best Novel and Campbell Award”. There are three whole days left before the Hugo nominating deadline, but I’m traveling starting tomorrow, so the final post in the series listing my Hugo nominees goes up today. As tends to be the case, the best novel category is the one I put the least effort into. I don’t tend to read most books in the year of their publication, so I’m only rarely sufficiently up to date that I have a full slate of nominees in this category. There are, in fact, more books that I would have liked to get to before the nominating deadline than there are on my ballot–books like Aliette de Bodard’s The House of Shattered Wings (which I may yet finish before the deadline), Ian McDonald’s Luna: New Moon, and Kim Stanley Robinson’s Aurora. Meanwhile, the always-interesting Campbell award is one that I tend to dedicate to short story writers–usually those who have impressed me over the year even if their stories didn’t quite cross the bar to make it onto my ballot. (9) EBOOKS. Max Florschutz continues the debate about ebooks in “The Question of Value Part 2 – Responses”. The market is failing the readers. Okay, now that might sound like a harsh judgement to pass, and perhaps I could voice it differently (also, that could be taken way out of context, so aggregate sites, you do not have permission to use that line without context). When I say market, for the most part, I’m not referring to the books themselves, or what the authors are producing, though in a way, we share part of the blame. No, what I’m referring to here is the actual market and the way ebooks are being handled. That is what is failing the readers. Misconceptions about ebooks that are not being properly explained to the readers, often overlapped with 2 and 3. Mishandling of ebooks by publishers. A general failure of the “User Interface” of ebook stores. With these, maybe now you can see why I say the market is failing the readers. Granted, there’s a little bit of equal blame there. After all, it doesn’t help the market when readers go around spreading misinformation rather than learning about the topic, but at the same time, if the market is deliberately making this information difficult to glean, and in some cases actively working to obfuscate things from the reader’s eyes, well, then I would say it’s definitely failed. So, I want to take a look at some of these concerns that were given, heading them under these three points, and see if we can’t cast a bit more light on things. (10) BANDERLOVE. Mark Sommer at Examiner.com reviews Bandersnatch in “Creative collaboration demonstrated in the Oxford writers group the Inklings”. “Bandersnatch: C.S. Lewis, J.R.R. Tolkien, and the Creative Collaboration of the Inklings” is the newly published adaptation of her 2007 book, re-written for a wider audience. “The Company they Keep” was meant for academic use. However, although the earlier book has been described as “easy and enjoyable to read” with “plenty to enjoy” for new fans and scholars alike, Glyer realized the “fundamentally academic” work should be updated. Besides being of interest to fans of Tolkien, Lewis, and the other Inklings, “Bandersnatch” also is also helpful to aspiring writers, artists, and inventors, providing suggestions on how to interact with others in the same kind of creative collaboration the Inklings did. (11) PUPPY COUNTING. Brandon Kempner introduces a series at Chaos Horizon, “Estimating the 2016 Hugo Nominations, Part 1”. I think those numbers are at least in the ballpark and give us a place to start modelling. Since you can’t vote against a pick in the nomination stage, we don’t need to know the difference between “No Awarders” and other more traditional Hugo voters. I’m going to combine all the non-Puppy voters into one big group, called the “Typical Voters.” I’ll initially assume that they’ll vote in similar patterns to past Hugo seasons before the Puppies. I’ll have more to say about that assumption later on. This entry was posted in Pixel Scroll and tagged Abigail Nussbaum, Barry Gray, Brandon Kempner, Ceres, Diana Pavlac Glyer, Geoff Willmets, Hugo Awards, Inklings, Jim C. Hines, K. Tempest Bradford, Max Florschutz, Myke Cole, Raymond Bolton, Rowena Cory Daniells, Sad Puppies by Mike Glyer. Bookmark the permalink. 6 am Friday, if I’ve calculated correctly. And I think it’s Central, not Pacific time, because Midamericon is Central time? Hmm. Make that 7:59 am Friday; it is Pacific time for some reason. Re: classical-historical novels. No love for the wonderful Lindsey Davis? Davis is great, but my vote still goes to Steven Saylor – he’s easily the most cerebral of the Roman-mystery authors, and his descriptions and language use feel classical where Davis sometimes feels a bit too modern. Since they never seem to send e-mail confirmations to me until a couple of days later, I cannot be sure, but I think I have completed my Hugo nominating ballot. Aaron: Since they never seem to send e-mail confirmations to me until a couple of days later, I cannot be sure, but I think I have completed my Hugo nominating ballot. You may wish to double-check your ballot. “Lightspeed” leveled up to Prozine, you see. 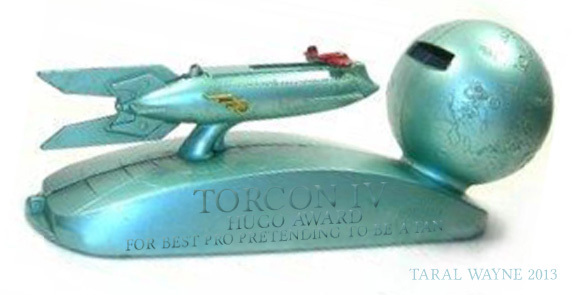 In April I’m going to start drafting a Proposal to Clarify the Hugo Artist Awards (does it need a catchy name? ), suggesting (among other things) that work for semiprozines should count as “Pro”, not “Fan” — as much on account of style and technique as anything else. I want to put up a few links to a fan artist I learned about too late to suggest for Doctor Science’s compilation: Likhain, who has a webpage and who has done a number of illustrations for the the semiprozine Lackington’s (this, this, or this…) She headlines her page “storytelling in art” and that’s apt; her pictures suggest stories, fairy tales of the dark kind mostly. Compare the pair of pictures “The Drowned Girl” and “Sirena“. Re (5): McCullough’s first three “Masters of Rome” books are brilliant (First Man in Rome, The Grass Crown, and Fortune’s Favorites). The series bogs down a bit when she gets too interested in Gaius Julius Caesar, becoming merely good. One of my favorite moments comes when Gaius Marius and young Caesar witness an apartment house fire and the financial shenanigans that go on during it. The same scene appears in one of Steven Saylor’s “Gordianus the Finder” series. But the two viewpoints – upper vs. lower classes, rich vs. poor – make them almost diametrically opposing takes on the same raw facts. And I, Claudius – loved the book, haven’t seen the TV adaptation nor read Claudius the God. Both are in my to-be-read/viewed pile, along with the HBO series Rome. Maybe I should retire . . .
Gillian Bradshaw’s The Beacon at Alexandria is also awesome. I actually just started rewatching the HBO series Rome, which really was quite excellent. And has one of the more … interesting … rafts you’re likely to encounter. Sympathy on the foiling of your evil plan. I had $5 riding on your success. Kip: Sympathy on the foiling of your evil plan. I had $5 riding on your success. I’m also vacillating on finishing my Short Story noms. I have about 4 vying for the final spot, too, but only one matches yours, Pocosin :-9 I really liked Hadley… and it was on my initial long list. My other 3 are Cremulator by Robert Reed, Little Fox by Amy Griswold, and The Language of Knives by Markov. Actually I’m so conflicted about this one decision, my number 4 spot might even change! I am not reading anything else before nominations close. I’m having enough problems wittling down my long list as it is! Is it just my inexperience or was this an unusually good year for shorts? I realize that there’s just a much higher volume of the short fiction, but it seemed like so much was really, really good! @emgrasso: Thanks for the “Shards” comments. Since I already own Smale’s novel, I’ll probably read that before I get to seriously looking into “Shards” anyway, but I’m keeping it on my “potential” list for now. @Various: Now I’m looking at I, Claudius audiobooks, thanks to all the talk here. One unabridged audiobook (sounds okay, not great); another that sounds very good (Derek Jacobi, but abridged! ), and a dramatised version that I don’t care for. Shoot, I’d like an unabridged version of the Derek Jacobi (un-dramatised) version. Curses, foiled! BTW the only Mary Renault book I’ve read so far is The Charioteer, which holds a special place in my heart (partially for Personal History Reasons). I listened to the audiobook a while back and it held up well! It’s not SFF at all, and not even ancient history like others discussed here. Some of Renault’s work crosses the border into fantasy, but even the stuff that doesn’t can reasonably be considered “fantasy adjacent”, i.e. full of fantasy-like tropes. She’s got a big fan base among SFF fans (including me). (b) Even if I could recover the game, it is built entirely in frakking Hypercard, the same damn basic platform the Miller brothers built Myst in, but Hypercard is dead. Monty-Python-parrot-level dead. Can’t even find an online emulator. @junego – There sure were lots of good stories; I had twenty on my list that I considered potentially award-worthy. But I doubt that is unusual; this is the first year I really tried to read “everything” (that is, all the stories recommended by a long list of bloggers), so I can’t compare to other years when I wasn’t paying so much attention. Didn’t Abigail Nussbaum complain that she wasn’t finding as many knock-your-socks-off stories this year? All in the reader’s freshness, maybe. As to whether shorter lengths were particularly strong, well, one reason there’s so much short is because most online publications have length limits. Your taste is clearly pretty similar to mine; “Little Fox” is solidly on my shortlist too. BTW, even though I read 600 short works, I didn’t manage to read “everything”; I still have quite a list of recommendations that I’ll never get to now. And Newfoundland is even less Canadian than Nova Scotia! But yes, Kate Beaton is definitely NOT American, and neither are her references. I read some Saylor, but one of his books was so overwhelmingly heterophobic I couldn’t believe a major publisher let it go by, what with the insulting 90% of the population. Yes, Davis uses more modern vernacular, but after all, her books aren’t written in Latin either. It’s hard to say because I generally find that most years have a really good crop of short stories. Because they’re the shortest length category, we end up with more of them so we’re spoilt for choice. It’s also why the 5% rule hammers that category particularly hard come nomination time. Confirmation bias? Maybe it seems that way because I have (and you might have too) made more effort to read Hugo eligible stories in the last year; all those recommendations having an effect? re: Rec list leftovers – I have a long list of unread, too. I may get to some…eventually…maybe…(in my dreams :-/ . I’m still saving the list, it’s only electrons. You’re probably right. I never would have found half the stories I read without hanging out here and using people’s recommendations as a guide to winnow wheat from chaff. So the quality of what I read probably was higher than the quality of the same sized random sample of the year’s shorts would have been! I have people like Mark and Vasha and JJ and you and Greg H., and Vivien, and Standback, and, and, and…all you Filers to thank for pointing to some gems. I do not presently live near space aliens, although Ye Olde Homestead does have a passable forest out back and my current domicile has a much thinner thicket of trees out front. However, I do possess a working floppy drive (3.5 and 5.25 combo) as well as (somewhere) an old SyQuest SparQ drive. No HyperCard, though. Perhaps you should look into Frotz instead. I remember when I figured out that you could do animation in HyperCard. Even make a rough of your motion on a background, use it, then change to another background. I sent my discovery in to CoEvolution Quarterly, and they thought it was interesting but too specialized (Mac only). The HyperCard game I miss is Blit. Once in a while, I wish I could play it again, just for the jollity. I got fairly proficient at it. @Greg, you can convert HyperCard to a format that a more modern HyperCard-like clone can deal with using either LiveCode (for simple stacks) or Stacksmith. Bob’s House can live again! Holy cow, this site is fantastic. @Stephen: Yes. Now to see if I can get it off the disk. @RevBob: Intriguing! I’ll see if I can find someone in L.A. who has a 3.5 drive. @Tasha: YES. YES, THE BIZARRE “BOB’S HOUSE” SHALL LIVE AGAIN. May you soon enjoy Bob’s House! Then I’ll need to get a house and call it Bob’s Game. My brain is a freakin’ jukebox. Put a phrase in, it spits out a song. I read this and immediately thought, “I GUESS THE WORLD WILL HAVE TO END WITHOUT WILLY” — from a King Missile song included in a mix tape a high-school friend made for me (I’m class of 1994), and which I recently dug out of storage and enjoyed the hell out of playing in the car’s cassette deck (it’s a 1997, it has a cassette deck). My effin’ brain. I don’t even. This is not a drive by-y-y-y-y. Actually, if you want to rescue data from older media, there are companies that specialise in that sort of thing – and there are devices you can buy to assist you if you prefer to do it yourself. One such device is the Kyroflux, which is a specialized floppy disk controller that you can buy which reads and records the magnetic flux transitions recorded on a floppy at a much higher resolution than normal floppy controllers, such that the data can later be analysed to reconstruct the contents of a floppy even if a normal floppy controller might be unable to determine what’s on there. The people who built the device also offer a data recovery service.